Energy Projects Plus is pleased to announce that we have recently achieved ISO14001 status. The charity underwent an external assessment in October, and on 7th December we were formally presented with a certificate to recognise this great achievement. ISO14001 is one of the environmental standards that an organisation can be awarded after being externally assessed by accredited assessors. It specifies the requirements for an environmental management system and applies to those environmental aspects of an organisations operation over which the organisation has control and can be expected to influence. Energy Projects Plus has taken itself through the process of setting up an Environmental Management System (EMS). Initially the EMS Team was set up to chart the organisation through the process that led to the awarding of the environmental British standard 8555. 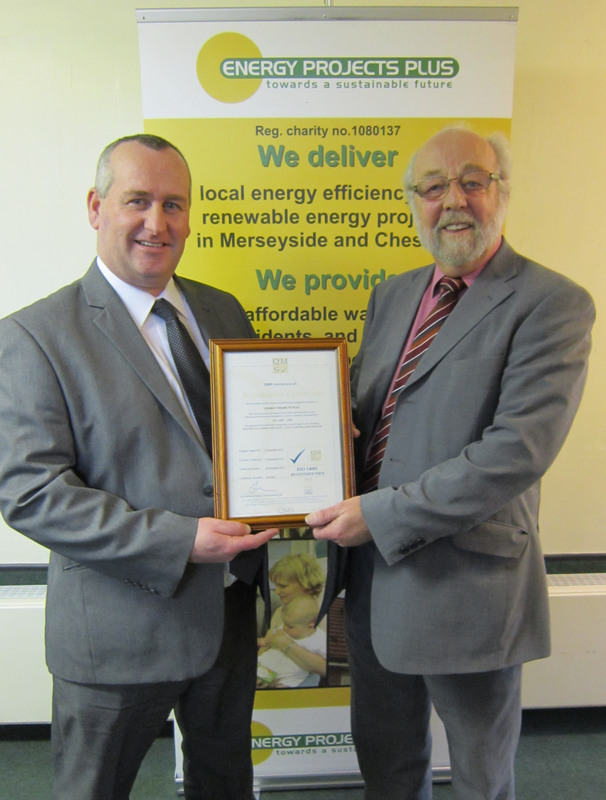 We achieved BS8555 in 2010 and it was renewed in 2011. However, it was decided to work towards the higher ISO14001 rather than continue with BS8555. The EMS Team had to consider all aspects of the organisations activities, such as energy and water usage, procurement, travel, recycling, financial investments and legal compliance. In all cases looking at mechanisms to be put in place, maintained and improved upon to reduce our environmental impact. The achievement of ISO14001 status by Energy Projects Plus is a significant milestone in its history. As an environmental charity it is important that we lead by example and our ISO14001 accreditation shows that we are doing just that.